If you are looking for something to bring warmth to your decor this holiday season, this beautiful red and gold wool area rug is just the thing you need. The intricate detailing and quality craftsmanship are unmatched at this price! Originally priced at $5,700.00, this gorgeous rug can be yours for a mere $1,800.00 when you purchase it from Rug Agent. Measures 8 ft. 6 in. x 11 ft. 6 in. A stunning addition to your home’s decor, this unique area rug will compliment your Christmas decorations throughout the holidays, and can easily become the centerpiece of your decorating throughout the rest of the year. The red and gold design is versatile enough to match just about any style. Whether you prefer a Victorian era decor, a shabby-chic decor, or a more modern style, this rug is sure to fit right in. Perfect to warm up the feel of those cold bare floors, or to place on top of your current carpet to add elegance and character to the room of your choice, this area rug is just what you need to complete your style! 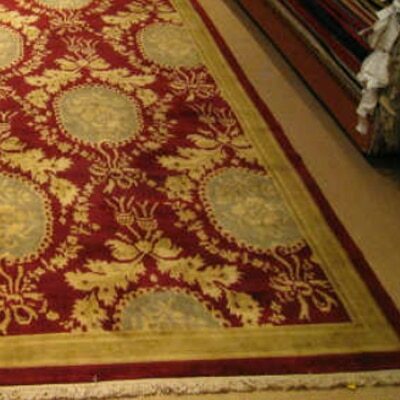 Order your hand knotted 100% hand spun wool area rug today, and add warmth to your room’s decor.